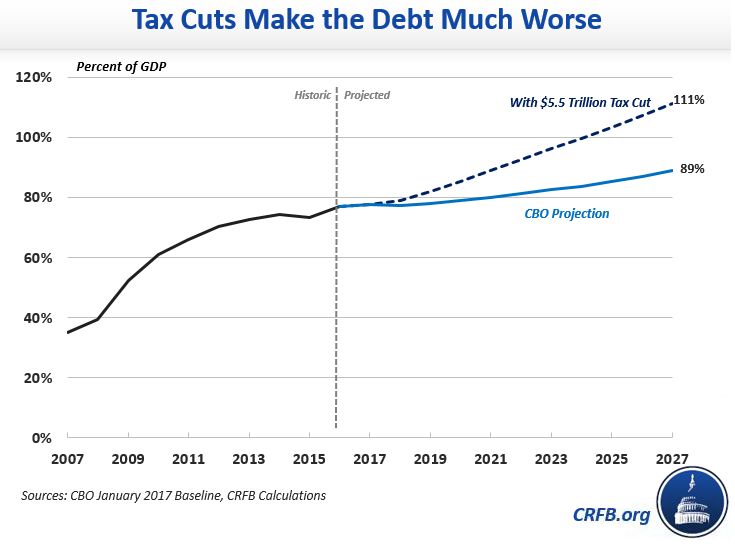 The Republican plans would stimulate the economy but at the cost of huge increases in the national debt, even taking into account the growth effects of these plans. Raising the top tax rate to 50%, a Democratic idea, would bring in an additional $100 billion per year in tax revenue, but this is neither enough to make a big dent on budget deficits or appreciably lower income inequality by redistribution. Combined with marginal tax rate cuts, each of these options would lead to substantial economic growth. However, the first option, ending the exclusion of employer-sponsored health insurance, is unlikely but rather this exclusion could be turned into tax credits as part of further healthcare reform. Likewise, removing the cap on the social security payroll tax is more likely to be used to raise additional revenue to make social security financially sound for the long run. Such changes would be revenue neutral and would lead to a long term GDP gain of 2.7%, a long term wage rate gain of 2.2% and a ten year dynamic revenue gain of $759 billion. Conclusion: it is possible to cut tax rates, broaden the tax base and grow the economy all at the same time and without increasing the deficit. This is what we should be doing!